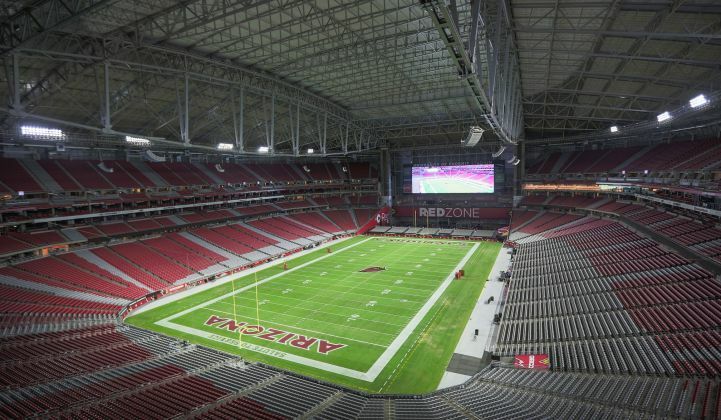 Tom Brady, Russell Wilson and everyone else at the University of Phoenix Stadium on Super Bowl Sunday (along with properly inflated footballs) will be bathed in the clear, crisp light of LEDs for the first time ever in an NFL championship game. It won’t just be fans in the stands and officials making calls who will notice the lighting upgrade for Super Bowl XLIX; the quality will be enjoyed by fans at home huddled around their HDTVs and seven-layer dips. “I would say it’s a noticeable difference,” said Scott Norton, director of marketing and public relations at University of Phoenix Stadium. The television crews, in particular, have given positive feedback about the upgraded illumination since it was first used during a game in September. The stadium had already been replacing older fixtures around the stadium with LEDs when it decided to make the switch for the field. Other sports stadiums had converted field lights to LEDs, which made operations managers and the general manager interested in making the switch ahead of the Super Bowl. The first considerations were energy savings and efficiency, although light quality, reduced maintenance and better controls were factors as well. The stadium chose Ephesus Lighting fixtures, which are outfitted with Cree LEDs. The system offers nearly double the illumination on the field using about half the number of fixtures. The switch to LEDs is expected to save 55 percent to 75 percent of lighting energy, and perhaps some additional savings in cooling costs. The stadium will not calculate actual savings until after the Super Bowl. Of course, hosting the Super Bowl is hardly an energy-efficient undertaking. The stadium has been in constant use leading up to the game, causing an increase in overall energy output for the stadium compared to its typical level of use. But the difficulties are surmountable, and LED adoption is growing. The Houston Texans also adopted LEDs this year, as have the San Francisco 49ers and NHL stadiums such as the PNC Arena. In Arizona, the University of Phoenix Stadium has already seen the benefits of LED adoption beyond NFL football, which only makes up about 10 percent of the approximately 120 events it hosts annually. Norton noted that for many events, such as hosting the Final Four for college football, stadiums compete to be the chosen host. Each stadium is looking for any type of technological upgrade to boast of. The controls on the LEDs allow for more precision when dimming the lights, as well as a faster response time when bringing the lights from off to on. Metal halide fixtures take several minutes to come back up to full brightness, said Norton, whereas the LEDs can come back on instantaneously. LEDs also offer easier maintenance. The Ephesus fixtures maintain 90 percent of their original output after a decade with no maintenance, while metal halide bulbs can degrade 40 percent in eighteen months. Lastly, switching to LEDs allowed the stadium to remove 20,000 pounds of fixtures from its catwalks. Not only does that make it easier to get around, said Norton, but it also makes it possible to add in more speakers or other equipment as needed. And of course, the impact of watching the power go out in New Orleans during the Super Bowl two years ago cannot be overstated. The University of Phoenix Stadium has worked with its local utility, Salt River Project, to ensure that the electrical supply for the stadium will withstand the demands of the Super Bowl. It helps to have lighting that does not strain the electrical system, said Norton. The savings for events could surpass what has been projected. Norton noted that the old metal halide fixtures often got extremely hot. Add in more than 60,000 people and blazing Arizona temperatures, and that means the AC was often cranking for games well into October. “We anticipate a significant savings,” he said. For the first few games the LEDs were used, the stadium still had the metal halide lights up, just in case. But the old fixtures have since been ripped down, and the management is fully confident in the LEDs moving forward. Now other stadiums are following suit. On Wednesday, Ephesus Lighting announced it will also be installing LEDs in the new Minnesota Vikings Stadium, which will open next year and host Super Bowl LII in 2018.